Don’t Cut This Mustard, Either . . . The differences separating annual, biennial, and perennial become clearer as one adds the experience of time to his or her book knowledge about wild plants and wildflowers. Last year, I began Wildflowers of the West Village with basic field guide facts under my belt and a passion for urban exploration. I followed the neighborhood’s growing season, surveyed the wild flowering species as each new one made its appearance. 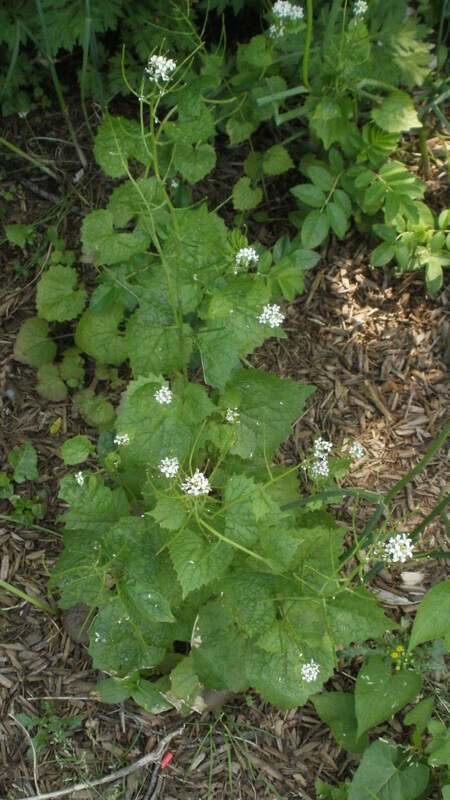 My list grew, yet a very common variety often found in cities, Garlic Mustard, stayed elusive during this time and ultimately remained out of sight; I wondered, why? My personal quest for a West Village example of Alliaria petiolata finally found its fulfillment this year. I answered my question in the process and learned a lesson that will aid in my future wild flower exploration. The reason why I could find no example last year became obvious when the experience of time revealed to me the full meaning of “biennial” plant. Garlic Mustard is a biennial plant. Last year there were examples all around my feet; first-year plants that eluded my radar because of their lack of flowers. This year, the plants have reached maturity and are in full flower around the West Village, hence easy now to find. To my amusement, the first specimens I discovered were thriving at the end of my own block. Horatio and Jane streets join beside the West Side Highway to form a kind of cul de sac. There is a pocket park located here, which separates the quiet residential street from the busy freeway. This garden has become a rich spot for observing wild flowering species, including onion grass, marsh marigold, yellow sow thistle, shepherds purse, common plantain, and mugwort. This year, as the marsh marigold waned, a new wave of white flowers took over center place. 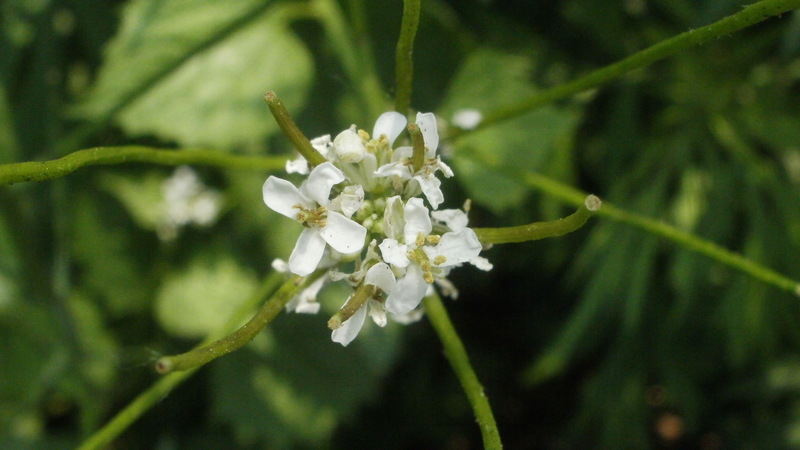 The plant itself was new to my eye: toothed heart-shaped leaves surrounding a tall central stem capped by a tight cluster of tiny, white, four-petal flowers. Beneath the flower head, radiating like the rungs of an old telephone pole, extended a number of long seed pods. The thin structures, called silique, resembled those of shepherds purse in their arrangement. Shepherds purse, which I profiled in June, 2010 (“Don’t Cut This Mustard”), is a member of the mustard family, Brassicaceae. I thought: Could this new flower that has seed pods like shepherds purse be a mustard family plant, too? Here was a clear opportunity to use an important tool in the amateur naturalist’s knapsack of tricks. I noted a physical feature of a new plant, likened it to another species with which I was already familiar, and then went to my reference shelf. Sure enough, after just a few seconds of consultation with my field guide, in this case the laminated broadside Invasive Weeds of North America: A Pocket Naturalist Guide, I used this most distinctive physical feature to make a positive identification. Garlic Mustard is a native of Europe and Asia that was imported to the United States on purpose during the Civil War era. The plant makes a decent show as a spicy salad green or as a source of added zest to pasta sauces. Mince a few fresh leaves and add to marinara or pesto for a locally-grown savory kick. Garlic Mustard is quite beautiful on its own and could make an attractive ornamental in addition to a practical garden herb. Like most immigrant species, the plant quickly escaped the confines of backyard gardens and spread into the American wild, even into urban green spaces, where it now thrives. Most people no longer view the plant as a welcome immigrant, but as an invasive pest.